Red Pepper Jelly - Canning Homemade! This pepper jelly with it's sweet and sour combination with just a hint of heat is the perfect appetizer jelly with brie, goat, or cream cheese. Slice up some of your favorite bagette into crostini's and you are ready to entertain the crowd. Preparation: Prepare 6 half pint lids, and rings. Sterilize the jars and keep them in the hot water till its time for processing. Remove stem and seed from peppers and rough crop. Place peppers with one cup of vinegar in blender or food processor. Blend till pureed smooth. Cooking: In a large stainless steel or enameled Dutch combine puree and chili flakes. Bring to a boil over high heat. Reduce the heat to medium and simmer, uncovered for 5 minutes. Stir in pectin and remaining cup of vinegar. Return to full boil on the highest heat. Stir in the sugar and bring back to boil for 2 minutes continual stirring. Remove from the heat. Filling the jars: On a dishtowel place your hot jars and using your funnel in each jar. Filling to 1/4" headspace. Remove air bubbles with a non-metallic utensil. Refill with liquid to fill to the correct headspace. Taking a clean papertowel wet it with warm water and wipe the rims of the jars removing any food particles that would interfere with a good seal. Using your magic wand extract the lids from the hot water and place them on the now cleaned rims. Add your rings to the tops of each of the jars and turn to seal just "finger tight". Processing: Make sure your rack is on the bottom of the canner and place the jars in the water bath making sure that the water covers each of the jars by 1 to 2 inches. Add hot water to the canner if it doesn't measure up. Cover the pot and turn up the heat under the canner and wait for the water to start boiling. 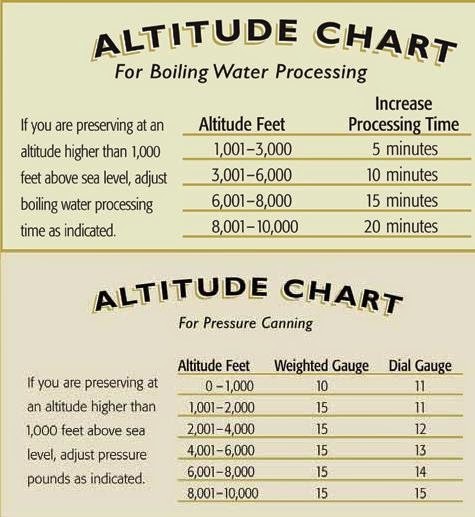 Once the water has come to a boil start your timer for 15 minutes. When complete turn off the heat and remove the cover and let the jars sit for another few minutes. Remove the jars and place them back on the dishtowel in a place that they will sit overnight to cool. Do not touch or move them till the next morning.